Ovarian cancer standard of care: are there real alternatives? Ovarian cancer remains a major issue for gynecological oncologists, and most patients are diagnosed when the disease is already advanced with a poor chance of survival. Debulking surgery followed by platinum-taxane chemotherapy is the current standard of care, but based on several different strategies currently under evaluation, some encouraging data have been published in the last 4 to 5 years. This review provides a state-of-the-art overview of the available alternatives to conventional treatment and the most promising new combinations. For example, neoadjuvant chemotherapy does not seem to be inferior to primary debulking. Despite its outcome improvements, intraperitoneal chemotherapy struggles for acceptance due to the heavy toxicity. Dose-dense chemotherapy, after showing an impressive efficacy in Asian populations, has not produced equal results in a European cohort, and the results of alternative platinum doublets are not superior to those of carboplatin and paclitaxel. In this setting, adherence to a maintenance therapy after first-line treatment and multiple (primarily antiangiogenic) agents appears to be effective. Although many questions, including the duration of maintenance treatment and the use of bevacizumab beyond progression, remain unanswered, new biologic agents, such as poly(ADP-ribose) polymerase (PARP) inhibitors, nintedanib, and mitogen-activated protein/extracellular signal-regulated kinase (MEK) inhibitors, have emerged as potential therapeutic options in the very near future. Based on the multiplicity of available strategies, the histological and molecular features of the tumor, in addition to patient’s clinical condition and disease state, continue to gain importance in guiding treatment choices. Epithelial ovarian cancer (EOC) still represents a major issue for gynecological oncologists, although more and more details about the carcinogenesis of ovarian neoplasms have been gradually clarified. The lack of obvious signs until advanced stages and the ambiguous symptoms described by patients make it difficult to diagnose the disease at a time when a curative approach is still feasible. The natural history of EOC is characterized by a high response rate to primary treatment (approximately 75%), which is quickly followed by early recurrence. At this point, although some patients benefit from second-line treatment with platinum, most eventually experience platinum-resistance and die from this disease. In 2014, the number of women dying from ovarian cancer in the United States is estimated at 14,270, and in Europe, the reported 5-year relative survival rate is 36%. In light of these data, it is not surprising that an incredible effort to change the standard of care and a considerable number of clinical trials are ongoing. Both the American and European guidelines recommend surgery as the initial approach to ovarian malignancies[3,4]; among these procedures are the total abdominal hysterectomy, bilateral salpingo-oophorectomy, omentectomy, visualization of all peritoneal surfaces, and random peritoneal biopsies plus peritoneal washing. Excising or biopsying any suspicious peritoneal area and sampling lymph nodes are also recommended practices. The significance of lymphadenectomy remains hotly debated; despite the prognostic relevance of nodal involvement at diagnosis, there is currently no strong evidence that systematic nodal dissection improves survival[5,6]. The goal of primary surgery, defined as optimal cytoreduction, is the absence of residual cancer. After surgery, adjuvant chemotherapy is mandatory in cases of suboptimal debulking (residual disease of 1 cm or more), advanced stages, or early stages with a high risk of recurrence. Each patient should be at least counseled about the opportunity for postoperative chemotherapy. Platinum agents have been considered the major resource in the medical treatment of EOC since a study by Lambert and Berry showed better outcomes for cisplatin-cyclophosphamide compared with cyclophosphamide alone. Subsequently, the cisplatin-paclitaxel doublet was demonstrated to be more effective than cisplatin-cyclophosphamide[8,9]. The final significant challenge presented to date has been the shift from cisplatin to carboplatin due to the number of trials that have been obtaining equal outcomes with less toxicity in carboplatin cohorts[10–12]. 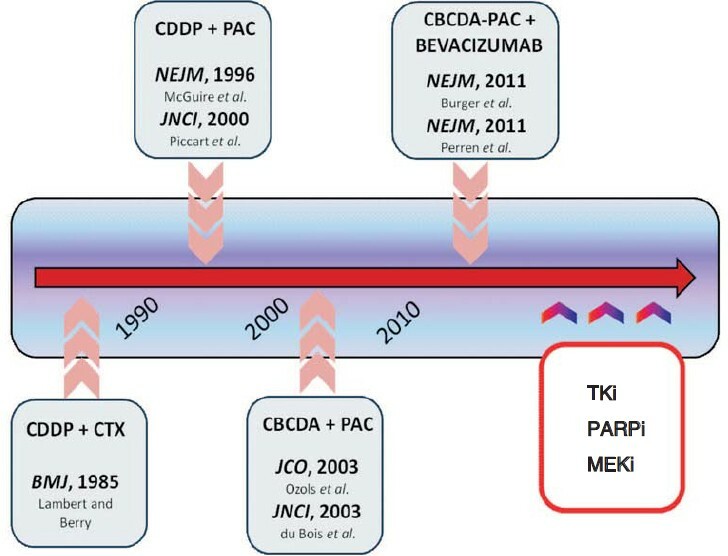 Figure 1 summarizes the major changes in ovarian cancer medical care over the last three decades. From the early 2000s, carboplatin in combination with paclitaxel has been the standard of care in the adjuvant and first-line settings, and, despite all relevant efforts, overcoming this standard in clinical practice has proven extremely hard. Attempts to improve survival and response rates using a triplet rather than the traditional doublet have failed to demonstrate an effective advantage. Finally, prolonging antineoplastic therapy after the conventional 5–6 cycles did not provide significantly better outcomes[14, 15]. Critical steps In epithelial ovarian cancer care. CDDP + CTX: cisplatin and cyclophosphamide; CDDP + PAC: cisplatin and paclitaxel[8,9]; CBCDA + PAC: carboplatin and paclitaxel[10,11]; CBCDA-PAC + BEVACIZUMAB: carboplatin, paclitaxel, and bevacizumab[41,42]; TKi: tyrosin-kinase inhibitors; PARPi: poly(ADP-ribose) polymerase inhibitors; MEKi: mitogen-activated protein/extracellular signal-regulated kinase inhibitors. Many research groups have tried to develop novel effective strategies for newly diagnosed patients, and several positive studies have been reported in the last 4 to 5 years. Here, we provide a state-of-the-art overview about the most significant published data (Table 1 ). a “x n” means “for n cycles of chemotherapy.” NACT: neoadjuvant chemotherapy; PS: primary surgery; CP: carboplatin plus paclitaxel; IDS: interval debulking surgery; HR: hazard ratio; CI: confidence interval; OS: overall survival; IP CHT: intraperitoneal chemotherapy; IPCisP: intraperitoneal cisplatin 100 mg/m2 on day 1 plus intraperitoneal paclitaxel 60 mg/m2 on day 8 every 3 weeks; IVCisP: intravenous cisplatin 75 mg/m2 on day 1 plus intravenous paclitaxel 135 mg/m2 on day 2 every 3 weeks; PFS: progression-free survival; IVC: intravenous carboplatin AUC 9 mg/mL per minute for 2 cycles every 28 days; IVP: intravenous paclitaxel 135 mg/m2 on day 1 every 3 weeks; IPCis: intraperitoneal cisplatin 100 mg/m2 on day 2 every 3 weeks; DD CHT: dose-dense; 3weeCP: 3 weekly carboplatin plus paclitaxel; 3weeC: 3 weekly carboplatin; wP: weekly paclitaxel; wCP: weekly carboplatin plus paclitaxel; QoL: quality of life; 3weeBCP: 3 weekly carboplatin plus paclitaxel plus bevacizumab; Bm: bevacizumab maintenance; CD: carboplatin AUC 5 mg/mL per minute plus docetaxel 75 mg/m2; C-LPD: carboplatin AUC 5 mg/mL per minute plus pegylated-liposomal-doxorubicin 30 mg/m2 every 3 weeks. Primary surgery is recognized around the world as a standard treatment for EOC, and optimal cytoreduction remains the main prognostic factor for survival and risk of recurrence. However, interval debulking surgery (IDS) has progressively become more popular, mainly due to its intent to reduce the volume of residual disease after primary surgery plus chemotherapy or after chemotherapy alone as much as possible. Given the increasing use of IDS in clinical practice, several trials have tried to validate this approach and to better define the category of patients who should be considered. Bristow and his group published a meta-analysis in 2006 considering 835 women with stages III–IV ovarian cancer who were treated with neoadjuvant chemotherapy followed by IDS. The authors concluded that preoperative chemotherapy was associated with inferior overall survival (OS) compared with initial surgery while underlining the negative survival effect of increasing the number of chemotherapy cycles prior to surgical intervention. Vergote et al. compared the survival outcomes of patients treated with conventional upfront surgery from 1980 to 1988 with those of patients treated with selective neoadjuvant chemotherapy from 1989 to 1997. The authors reported a higher 3-year survival rate for the second cohort and supported the use of delayed surgery in highly selected patients. However, the most important trial on neoadjuvant chemotherapy is certainly the EORTC55971 trial (ClinicalTrials.gov identifier: NCT 00003636), which constitutes the first prospective multicentric trial to evaluate preoperative platinum-based chemotherapy followed by IDS versus primary surgery followed by postoperative chemotherapy. The study included 670 patients with stage IIIC or IV EOC, and the chemotherapy consisted of at least 6 cycles of carboplatin and paclitaxel (with 3 cycles administered prior to surgery in the experimental arm). No difference was found between the two populations in terms of outcomes, with a progression-free survival (PFS) of 12 months in both groups, an OS of 29 versus 30 months, and comparable quality of life reports. However, a significantly higher rate of optimal debulking was observed in the IDS arm (80% versus 42%). The authors concluded that neoadjuvant chemotherapy is not inferior to primary surgery, although the latter remains the standard of care. Kehoe et al. presented at the 2013 annual meeting of American Society of Clinical Oncology (ASCO) the preliminary results of the CHORUS trial (ClinicalTrials.gov identifier: NCT00075712), which recruited 550 women with the same characteristics (stage IIIC or IV EOC). The data reported are consistent with those of the EORTC55971, with both indicating that primary chemotherapy is not inferior to primary surgery, is associated with increased optimal cytoreduction, and bears less postoperative mortality. Based on these results, even though primary surgery remains the standard of care, neoadjuvant chemotherapy should be considered in very selected patients, specifically among women with stage IIIC or IV disease. In particular, the evidence of extensive tumor deposits (larger than 5 cm) on preoperative imaging and the presence of metastatic lesions appearing difficult to resect might predict that an optimal cytoreduction will be difficult to achieve. In such cases, to avoid incomplete debulking and unnecessary postoperative morbidity and mortality, neoadjuvant chemotherapy is recommended. There is a strong rationale for the use of intraperitoneal (IP) chemotherapy in the treatment of EOC, mainly due to the common spread of the disease in the abdominal cavity without the involvement of other sites. Initially, it was postulated that delivering chemotherapy directly to the peritoneal cavity might reduce the risk of myelotoxicity due to the presumed minor exposure of normal tissue to antineoplastic agents. Sadly, such hypotheses have not been confirmed by clinical experience, which has instead suggested cogent toxicity issues. Both the American and European guidelines support the use of IP chemotherapy as a viable alternative to intravenous (IV) treatment on the basis of a large phase III randomized trial (the GOG172) including 429 women with stage III EOC. All subjects were treated with optimal debulking surgery, followed by IV or IP chemotherapy. In the experimental arm, the patients received IP cisplatin (100 mg/m2) on day 1 and IP paclitaxel (60 mg/m2) on day 8; in the control arm, both cisplatin (75 mg/m2) and paclitaxel (135 mg/m2) were administered intravenously on days 1 and 2, respectively. One cycle was given every 3 weeks, and the experimental arm showed a significant benefit compared with the control arm in the PFS (23.8 versus 18.3 months, P = 0.05) and OS (49.7 versus 65.6 months). In another phase III trial involving a similar population (the GOG114), the investigators proposed a new regimen combining IP and IV chemotherapy. In the experimental arm, patients were given IV carboplatin with an area under the curve (AUC) of 9 mg/mL per minute for 2 cycles every 28 days. Four weeks later, IV paclitaxel (135 mg/m2) on day 1 and IP cisplatin (100 mg/m2) on day 2 were administered for 6 cycles. For the control arm treatment, 6 cycles of paclitaxel (135 mg/m2) and cisplatin (75 mg/m2) were given every 3 weeks on days 1 and 2, respectively. The final analysis included 462 women and reported a significantly longer PFS (27.9 versus 22.2 months, P = 0.01) in the experimental arm and a considerable, though not significant, advantage in OS (63.2 versus 52.2 months, P = 0.05). Furthermore, a meta-analysis considering those two studies, spanning a total of 826 patients, recently confirmed a long-term survival benefit (median follow-up, 10.7 years) for IP chemotherapy (OS, 61.8 versus 51.4 months, P = 0.048). Despite such encouraging findings, IP chemotherapy still raises many concerns among oncologists and has been adopted only in a few centers. Reasons for this unpopularity include (1) the heavy adverse effects reported in both trials (grades 3–4 pain, fatigue, and hematologic toxicities were significantly more common in the IP cohort), (2) the insertion and management of the IP catheter, and (3) the associated complications and worse quality-of-life scores observed in the experimental arms[23,24]. It is unsurprising that, in the GOG172, only 86 of 170 patients (42%) randomized to IP chemotherapy completed all 6 cycles. Of note, in both trials, the GOG172 and GOG114, the dose intensity significantly varied between the two arms, and in the GOG172 trial, the dose of paclitaxel given in the experimental arm was fractionated. These factors may have contributed to the better outcomes observed through the IP route. A number of studies focused on IP chemotherapy are currently ongoing (i.e., the GOG252, ClinicalTrials.gov identifier: NCT00951496; the PETROC, ClinicalTrials.gov identifier: NCT00993655; the iPOC, ClinicalTrials. gov identifier: NCT01506856), all of which have the advantage of maintaining a constant dose intensity. Hopefully, these trials will provide further data about this strategy and useful elements to improve patient safety. Conventional first-line chemotherapy for ovarian cancer consists of IV paclitaxel (175 mg/m2) administered over 3 hours, followed by IV carboplatin at an AUC of 5–6 mg/mL per minute, which is repeated every 3 weeks for 6 cycles. However, recent studies have explored alternative schedules of this doublet, providing increasing amounts of data regarding dose-dense chemotherapy. Many preclinical studies suggest the potential advantages associated with the weekly administration of antineoplastic agents, such as enhanced antitumor activity and minor risk of toxicity (due to extended exposure but fairly low concentration of the drug)[25,26]. Furthermore, paclitaxel given every week at a lower dose is expected to exert an antiangiogenic effect and has already been demonstrated to improve response and survival in phase III trials for breast cancer[28,29]. The JGOG 3016 was a multicentric Japanese study exploring weekly paclitaxel (80 mg/m2, days 1, 8, and 15) in combination with carboplatin every 3 weeks (an AUC of 6 mg/mL per minute, on day 1) versus a standard 3-week regimen[30,31]. The trial included 631 women with stages II to IV EOC, and the results showed impressive improvements in PFS and OS among patients in the experimental arm [PFS: 28.2 versus 17.5 months, hazard ratio (HR) = 0.76, 95% confidence interval (CI) = 0.62→0.91, P = 0.004; OS: 100.5 versus 62.2 months, HR = 0.79, 95% CI = 0.63→0.99, P = 0.039]. As for safety, hematologic toxicity was the most common reason for treatment discontinuation and was significantly more frequent among patients assigned to dose-dense treatments (60% versus 43%, P = 0.03). However, no difference was detected between dose-dense group and 3-weekly group regarding neurotoxicity (3% versus 7%)[30, 31]. The MITO-7 was a European trial involving 810 patients with stages IC to IV EOC. This trial was designed to compare a conventional tri-weekly scheduling system with a weekly regimen of carboplatin (an AUC of 2 mg/mL per minute) and paclitaxel (60 mg/m2), which were administered for 6 cycles and 18 consecutive weeks, respectively. Initially, the aim of the study was to collect the data on quality of life of women randomized to receive a certain regimen; subsequently, after the publication of the Japanese findings, PFS became the co-primary endpoint. The MITO-7 results were significantly different from the Japanese data, which found that weekly treatments were not associated with improved outcomes between the control and experimental arms [PFS: 17.3 versus 18.3 months; estimated 2-year survival rate: 78.9% versus 77.3%; response rate (RR): 58.8% versus 56.2%]; the quality of life reports and toxicity rates showed a better tolerability profile for the weekly scheduling. It should be noted that the scheduling used in the MITO-7 was quite different from that adopted in the JGOG 3016, as paclitaxel was given at a lower dose (60 mg/m2 versus 80 mg/m2) and carboplatin was administered at an AUC of 2 mg/mL per minute every week in combination with paclitaxel. Given the bone marrow-sparing effects of paclitaxel when administered with carboplatin, either factor, the different dose and the separation of carboplatin and paclitaxel, could explain these discordant results. Furthermore, the different populations, the Asian and European, might well constitute a reason behind these contrasting clinical outcomes; in particular, distinct profiles of response and tolerability have often been attributed to genetic polymorphisms involved in drug metabolism and chemosensitivity[33,34]. The MITO-7 findings are consistent with the conclusion of another European trial by van der Burg et al., which confirmed no evidence of benefit from dose-dense paclitaxel and carboplatin over a standard tri-weekly regimen. However, this study used an alternative schedule consisting of 6 weeks of weekly carboplatin and paclitaxel as induction chemotherapy followed by IDS when feasible and 3 or 6 cycles of standard 3-weekly treatment. The GOG262 trial evaluated the efficacy of weekly treatment as a first-line treatment, with or without bevacizumab (15 mg/kg every 3 weeks). Although the full paper is not yet available, the preliminary data were recently released. Interestingly, among patients treated with bevacizumab, there was no significant difference in the PFS between the tri-weekly and weekly arms. However, in the group not receiving bevacizumab, there was a significant PFS benefit (14 versus 10 months, HR = 0.60, 95% CI = 0.37–0.96) for the dose-dense group. It is worth repeating that, in both the GOG262 and JGOG 3016 trials, carboplatin was given tri-weekly; only the paclitaxel was given every week (80 mg/m2). The ICON 8 trial (ClinicalTrials. gov identifier: NCT01654146), which is ongoing, is a tri-armed phase III trial comparing the 3 possible schedules of treatment (triweekly carboplatin and paclitaxel, tri-weekly carboplatin plus weekly paclitaxel, and weekly carboplatin and paclitaxel). These forthcoming data might help to clarify this scenario and to validate the already available data. The combination of carboplatin and paclitaxel is considered the standard initial treatment for EOC and is believed to constitute a highly active regimen with acceptable toxicity. However, several adverse effects of paclitaxel, mainly alopecia and neurotoxicity, have prompted researchers to look for new doublets with potentially superior or at least equivalent efficacy but better patient tolerability. The SCOTROC 1 trial was a Scottish randomized phase III trial involving 1,077 women with stages IC to IV EOC, which was designed to compare the carboplatin-paclitaxel doublet with the carboplatin-docetaxel doublet. Carboplatin was given with an AUC of 5 mg/mL per minute in both groups, and the paclitaxel and docetaxel dosages were 175 mg/m2 and 75 mg/m2, respectively. The rationale for the study was based on the activity of the carboplatin-docetaxel doublet shown in a previous phase II trial testing various combinations as a first-line treatment for EOC. There was no difference between the docetaxel and paclitaxel arms in the PFS, OS, and RR (PFS: 15.0 versus 14.8 months, P = 0.707; 2-year survival rates: 64.2% versus 68.9%, P = 0.238; RR: 58.7% versus 59.5%, P = 0.868). The reported toxicities included a significantly higher rate of myelosuppression (including complicated grades 3–4 neutropenia) in the carboplatin-docetaxel arm and a significantly higher rate of neurotoxicity in the carboplatin-paclitaxel arm. In conclusion, the authors recommended docetaxel be considered in combination with carboplatin as a valid alternative to paclitaxel, as the two doublets appear to have the same efficacy. Docetaxel seems to be particularly indicated in cases with an increased risk of neurotoxicity. The other platinum-based doublet that has not been shown to be superior compared with carboplatin-paclitaxel is carboplatin-liposomal pegylated doxorubicin (LPD). This combination was explored in the MITO-2 trial, a large randomized phase III Italian trial aiming to demonstrate the efficacy of carboplatin-LPD as an initial chemotherapy in light of the promising results observed in a recurrent setting. Between January 2003 and November 2007, 820 patients with stages IC to IV EOC were recruited and randomized to receive paclitaxel (175 mg/m2) or LPD (30 mg/m2) plus carboplatin (an AUC of 5 mg/mL per minute). To guarantee the same platinum dose, both schedules consisted of 6 cycles administered at 3-week intervals. The carboplatin-LPD combination did not result in superiority over the carboplatin-paclitaxel doublet in regards to PFS, OS, and RR (PFS: 19.0 versus 16.8 months, P = 0.58; OS: 61.6 versus 53.2 months, P = 0.32; RR: 57% versus 59%, P = 0.76) but has been demonstrated to be an adequate alternative to standard treatment. Despite the equivalent efficacy, the platinum-paclitaxel and platinum-LPD doublets generate extremely different adverse effect profiles. Although leukopenia, neutropenia, and febrile neutropenia occurred without significant differences in both patient groups, thrombocytopenia, anemia, stomatitis, and skin toxicity were found significantly more frequently in the experimental arm. In contrast, neuropathy, diarrhea, and hair loss were the most common toxicities detected in those patients assigned to standard treatment. To summarize, carboplatin-LPD may be an alternative to carboplatin-paclitaxel that deserves particular attention when patients wish to avoid alopecia or present a higher risk of peripheral neuropathy. Different biologic molecules have been investigated in the first-line setting (Table 2 ). Although at present the data on bevacizumab are more mature, other antiangiogenic agents and tyrosine-kinase inhibitors (TKis) may be emerging as future therapeutic options, especially for maintenance treatment. a “x n” means “for n cycles of chemotherapy.” CP: carboplatin AUC 5 mg/mL per minute and paclitaxel 175 mg/m2 every 3 weeks; Pl: placebo; B: bevacizumab; Bm: bevacizumab maintenance; PFS: progression-free survival; N: nintedanib; Paz m: pazopanib maintenance. Bevacizumab (Avastin®; Genentech, San Francisco, CA, USA) is a humanized monoclonal antibody that binds to vascular endothelial growth factor A (VEGF-A) and is recognized as a potent antiangiogenic agent. After its approval by the Food and Drug Administration (FDA) and European Medicines Agency (EMA) for the treatment of many solid malignancies (e.g., colorectal and lung cancers), bevacizumab has proven to be highly active in EOC as well. It is becoming clear that such efficacy is applicable to all stages of the ovarian disease, as noted by several trials published in the last 3 to 4 years. In 2011, 2 first-line trials, the GOG218 and the ICON7, reported that the addition of bevacizumab to carboplatin and paclitaxel, followed by maintenance therapy with bevacizumab alone, significantly prolonged the PFS (14.1 versus 10.3 months in the GOG218, HR = 0.72, P < 0.001; 19.0 versus 17.3 months in the ICON7, HR = 0.81, P = 0.004). Furthermore, the final results of the ICON7 showed an OS improvement of 7.8 months in the bevacizumab arm (36.6 versus 28.8 months, HR = 0.64, P = 0.002) for the subgroup of patients with the worst prognosis (FIGO stage IV or FIGO stage III and more than 1.0 cm of residual disease after debulking surgery), although this subgroup analysis was not preplanned and was only exploratory in nature. The OCEANS trial focused on patients with platinum-sensitive recurrence and tested bevacizumab in combination with carboplatin and gemcitabine. In the experimental arm, after 6 to 10 cycles of bevacizumab plus chemotherapy, bevacizumab was continued as maintenance treatment until the appearance of progression or unacceptable toxicity, and the final report documented a PFS advantage of 4 months (12.4 versus 8.4 months, HR = 0.484, 95% CI = 0.388–0.605, P < 0.001), regardless of all of the variables considered (age, performance status, time to recurrence, and cytoreductive status). Finally, the PFS improvement determined by bevacizumab was demonstrated in the subgroup of platinum-resistant patients by the AURELIA trial, which compared chemotherapy alone (paclitaxel, topotecan, or LPD) with chemotherapy plus bevacizumab followed by bevacizumab maintenance until the appearance of progressive disease or unacceptable toxicity. The PFS was statistically longer in the bevacizumab arm (6.7 versus 3.4 months, HR = 0.46, P < 0.001), and OS data showed a favorable trend for the experimental arm (16.6 versus 13.3 months) but without statistical significance. Despite these positive results, there are still many issues about the use of bevacizumab in EOC patients. It remains unsure whether patients would benefit from its use as a first-line treatment or whether the maintenance with bevacizumab should be prolonged beyond 15 months. The BOOST trial (ClinicalTrials.gov identifier: NCT01462890) will hopefully address these questions. As a second-line treatment for patients who have recurrences or progressions during maintenance, the MITO16/MANGO-2b trial (ClinicalTrials.gov identifier: NCT01802749) was designed to test the potential efficacy of continuing bevacizumab beyond progression. Because the literature shows efficacy in first-line as well as in platinum-sensitive and platinum-resistant recurrences, when should bevacizumab be given? Would it make sense to wait until recurrence? The current data are not sufficiently strong to encourage this approach, but further studies could introduce new scenarios. Finally, interesting biomarkers are currently under development as predictive factors of response to bevacizumab (e.g., circulating levels of Ang1 and Tie2) and immune versus proangiogenic tumor molecular subgroups. Several ongoing trials, including the MITO16/ MANGO-2, are focused on these aspects (ClinicalTrials.gov ClinicalTrials.gov identifier: NCT01706120), which aim to identify which patients could benefit from treatment based on such molecular features. Targeting other pathways involved in cell proliferation and carcinogenesis may be another effective strategy to treat EOC patients and overcome resistance to bevacizumab. Pazopanib is an orally administered, multi-targeted kinase inhibitor; its targets include VEGF receptors 1, 2 and 3, platelet-derived growth factor receptors (PDGFRs), and fibroblast growth factor receptor (FGFR). Pazopanib was approved by the FDA in October 2009 and by the EMA in June 2010 for the treatment of metastatic renal cell carcinoma. Given the preclinical and clinical evidence supporting a critical role of angiogenesis in ovarian cancer pathogenesis and ascites formation[50–52], pazopanib was first tested in a phase II trial including 36 patients with recurrent disease. The results were very encouraging regarding both the safety and the RR. The most common adverse effects were fatigue, elevation of alanine aminotransferase (ALT) and aspartate aminotransferase (AST), and hypertension; 31% of patients had a cancer antigen (CA)-125 response; and 56% had stable disease (SD; median duration of SD, 80 days). The results from the AGO-OVAR 16, a phase III, randomized, placebo-controlled trial of pazopanib versus placebo as maintenance after first-line treatment for stages II–IV EOC, were presented at ASCO 2013. Patients received surgery and platinum-taxane chemotherapy (at least 5 cycles) followed by 800 mg pazopanib once daily or placebo for up to 24 months. The primary endpoint was PFS, and the secondary endpoints included OS, safety, and quality of life. Patients in the pazopanib arm had a prolonged PFS compared with those in the placebo arm (median PFS, 17.9 versus 12.3 months, HR = 0.766, 95% CI = 0.64–0.91, P = 0.002) and safety features consistent with the toxicity profiles already observed in renal cancer patients (hypertension, diarrhea, and nausea), although further dose reductions are needed. Based on these safety results and the absence of OS benefit, the development of this drug in EOC is not expected to progress. Nintedanib (BIBF 1120) is an intracellular inhibitor that targets multiple receptor tyrosine kinases, including the VEGF, fibroblast growth factor (FGF), and platelet-derived growth factor (PDGF) receptors. This agent has been shown to be active and safe for the treatment of idiopathic pulmonary fibrosis (IPF), a fatal lung disease that seems to be related to an aberrant proliferation of fibrous tissue in the pulmonary interstitium. The AGO-OVAR 12 was a randomized phase III trial that explored this drug in combination with carboplatin and paclitaxel as a first-line treatment for FIGO stages IIB–IV EOC. A total of 1,366 patients were recruited and randomized at a ratio of 2:1 to nintedanib 200 mg twice per day plus carboplatin and paclitaxel or to carboplatin and paclitaxel plus placebo. The PFS was longer in the experimental arm (median PFS, 17.3 versus 16.6 months; HR = 0.84, 95% CI = 0.72–0.98, P = 0.024), and a greater benefit was observed in the subgroup of low-risk patients (median PFS, 20.8 versus 27.1 months; HR = 0.75, 95% = 0.61–0.92, P = 0.005). In contrast to the results from the ICON7 trial, the major adverse events were gastrointestinal and hematologic symptoms in nature. Poly(ADP-ribose) polymerase (PARP) is a family of nuclear proteins involved in DNA repair. The best understood member of this family is PARP1, which repairs the spontaneous single-strand breaks (SSBs) that occur continuously during replication. PARP1 also plays a key role in preventing double-strand breaks (DSBs), which derive from persistence of SSBs and replication fork collapse. Because DSBs should be repaired by the homologous recombination (HR) pathway, the anti-cancer mechanism of PARP inhibitors is closely related to a compromised function of the HR. Mechanisms of defective HR include either germline or somatic BRCA1 and BRCA2 mutations, BRCA1 promoter methylation, and other genetic and epigenetic abnormalities of the HR pathway genes. The rationale for testing such agents in ovarian disease is the high rate of genetic or epigenetic abnormalities found in the HR pathway and observed in EOC (including BRCA1 and BRCA2 genes in approximately 50% of cases). Germline BRCA1 and BRCA2 mutations have been identified in approximately 15% of all EOCs, which is a low estimation if high-grade serous (HGS) histology (up to 22.6%) is considered. In general, somatic BRCA1 and BRCA2 mutations are estimated to occur in 7% of all EOC[60–62]. The clinical development of PARP inhibitors has been accelerated again following encouraging data on their efficacy in EOC treatment. Given their demonstrated activity as single agents and toxicity profiles, including myelosuppression and gastrointestinal adverse effects, most studies focus on maintenance treatment after chemotherapy rather than combinations with antineoplastic drugs. Olaparib is certainly the best known PARP inhibitor, although a number of agents in the same class are currently under evaluation. Three phase II trials testing olaparib in different settings have been already published[63–65], and a phase III FDA registration trial is ongoing (ClinicalTrials.gov identifier: NCT01844986). In the phase II trial by Ledermann et al., olaparib, which is given as a maintenance treatment after platinum-based chemotherapy, was compared with placebo in patients with platinum-sensitive, recurrent, HGS ovarian cancer. A total of 265 women were recruited, and PFS, which was the primary endpoint, was found to be significantly longer in the experimental arm (median PFS, 8.4 versus 4.8 months; HR for progression or death, 0.35; 95% CI = 0.25–0.49; P < 0.001). Furthermore, the ASCO 2013 data on the subgroup of patients harboring a BRCA mutation, either germline or somatic, showed that this population had the greatest benefit from maintenance with olaparib (median PFS, 11.2 versus 4.1 months; HR = 0.17, 95% CI = 0.09–0.32, P < 0.001). An ongoing phase III trial, the SOLO 1, is focused on germline BRCA mutation carriers with newly diagnosed EOC; olaparib maintenance is compared with placebo after platinum-based chemotherapy, again using PFS as the primary endpoint (ClinicalTrials.gov identifier: NCT01844986). The SOLO 2 trial (ClinicalTrials.gov identifier: NCT01874353) uses the same design (germline BRCA mutations carriers, olaparib maintenance versus placebo after platinum-based chemotherapy), but in a recurrent setting (only platinum-sensitive relapse). Other PARP inhibitors are also under development, namely niraparib (ClinicalTrials.gov identifier: NCT01847274) and rucaparib (ClinicalTrials.gov identifier: NCT01891344), both of which are currently being tested in platinum-sensitive recurrence. Since the entry of the carboplatin-paclitaxel doublet into routine clinical practice, a relative standstill in the literature has come to pass. However, within the past 5 years, several positive trials have begun to suggest possible new therapeutic options. In short, at present, alternatives to standard therapy do exist, but none has proven to be superior to conventional treatments, with the notable exception of carboplatin-paclitaxel plus bevacizumab. In light of the available data, none of the other options can be considered a “new standard”; still, each may be valid for a particular subgroup of patients, such as neoadjuvant chemotherapy for patients who are not fit at diagnosis, dose-dense chemotherapy for fragile or elderly patients, and docetaxel or PLD as paclitaxel substitutes for patients who have paclitaxel allergy or who desire to avoid alopecia. It remains unsure whether clinicians will adopt the IP chemotherapy approach, as data regarding its clinical efficacy need to be confirmed by ongoing trials. Further, significant practical issues persist (e.g., few centers offer the insertion and management of IP catheters; serious adverse effects can arise). Undoubtedly, great hopes have been placed on certain target therapies, in particular, antiangiogenetic agents; the GOG218 and the ICON7 trials[41, 42] demonstrated that bevacizumab should be given to all patients with a high risk of recurrence in combination with platinum-based chemotherapy and, most importantly, as maintenance. At present, there is no evidence that maintenance with bevacizumab is more active than maintenance with pazopanib, olaparib or cediranib (which have shown impressive efficacy in the setting of recurrence). However, this maintenance strategy appears to be more effective compared with the addition of a third agent to the conventional platinum doublet. In the era of the molecular characterization, it has been observed that less common subtypes of EOC have distinct genetic profiles compared with those of HGS EOC, which accounts for more than 70% of all ovarian carcinomas; as a consequence, these histotypes might be sensitive to specific target agents. In particular, low-grade serous ovarian cancers (LGSOC) often present with BRAF or KRAS mutations, leading to the up-regulation of the MAPK pathway and often responding to mitogen-activated protein/ extracellular signal-regulated kinase (MEK) inhibitors. A phase II trial about selumetinib in this setting prompted the development of two phase III trials exploring agents of the same class in recurrent or persistent LGSOC. The “MILO study” (ClinicalTrials.gov identifier: NCT 01849874) and “Trametinib in treating patients with recurrent or progressive LGSOC or peritoneal cavity cancer” (ClinicalTrials. gov identifier: NCT 02101788) both compared MEK inhibitors with a standard therapy chosen by the physician. Clear cell carcinomas, which represent a rare form of EOC (10%), are considered chemoresistant and have been associated with a poor prognosis. Mutations of PIK3CA have been identified in 33% of such tumors; hence, multiple phosphatidylinositol-3-kinase (PI3K)/protein kinase B (PKB, also AKT)/mammalian target of rapamycin (mTOR) inhibitors have been tested in preclinical studies, some of which resulted in the need for further evaluation in early-phase clinical trials. A trial comparing carboplatin and paclitaxel with carboplatin and paclitaxel plus temsirolimus as a first-line treatment for newly diagnosed, stages III–IV clear cell ovarian carcinoma is currently ongoing (ClinicalTrials.gov identifier: NCT 01196429). Future resources are required to personalize as much of the first-line treatment as possible. Critical steps include routine BRCA testing for all ovarian patients, research into diagnostic markers of HR deficiency, and the development of a system to genetically characterize each neoplasm. Based on the current wide prevalence of antiangiogenic drugs, more tailored therapies based on individual histological and biological characteristics are expected to be developed in the years to come. HGS EOC will be likely treated with PARP inhibitor maintenance; LGSOC therapy will include MEK inhibitors; and the clear cell histotype that remain resistant may eventually benefit from mTOR inhibitors. Finally, as gynecological oncology research has moved forward, the crucial importance of high-quality surgical techniques seems to indicate the need for centralizing EOC care at specialized centers. National Cancer Institute. Available at: http://www.cancer.gov/cancertopics/types/ovarian. Morgan RJ, Armstrong DK, Alvarez RD, et al. NCCN guidelines for treatment of ovarian cancer. Version 3. 2014. Available at: http://www.nccn.org/professionals/physician_gls/pdf/ovarian.pdf. Kehoe S, Hook J, Nankivell M, et al. Chemotherapy or upfront surgery for newly diagnosed advanced ovarian cancer: results from the MRC CHORUS trial. J Clin Oncol, 2013,31 suppl:abstr 5500. Available at: http://meetinglibrary.asco.org/content/112631-132. Oza AM, Perren TJ, Swart AM, et al. ICON7: final overall survival results in the GCIG phase III randomized trial of bevacizumab in women with newly diagnosed ovarian cancer. ECCO 2013. Abstract No. 6. Available at: http://2013.europeancancercongress.org/Scientific-Programme/Abstract-search.aspx?abstractid=8966. Gourley C, McCavigan A, Perren T, et al. Molecular subgroup of high-grade serous ovarian cancer (HGSOC) as a predictor of outcome following bevacizumab. J Clin Oncol, 2014,32 suppl:abstr 5502. Available at: http://meetinglibrary.asco.org/content/133112-144. Ledermann JA, Harter P, Gourley C, et al. Olaparib maintenance therapy in patients with platinum-sensitive relapsed serous ovarian cancer (SOC) and a BRCA mutation (BRCAm). 2013 ASCO Annual Meeting. Abstract 5505. Available at: http://meetinglibrary.asco.org/content/112248-132. Ledermann JA, Perren TJ, Raja FA, et al. Randomised doubleblind phase III trial of cediranib (AZD 2171) in relapsed platinum sensitive ovarian cancer: results of the ICON6 trial. ESMO 2013. Abstract No. 10. Available at: http://2013.europeancancercongress.org/Scientific-Programme/Abstract-search?abstractid=8897.